We have met scholars on these pages before and each is remarkable in their own way but for those who reach academic excellence at a very young age, we reserve a special welcome. 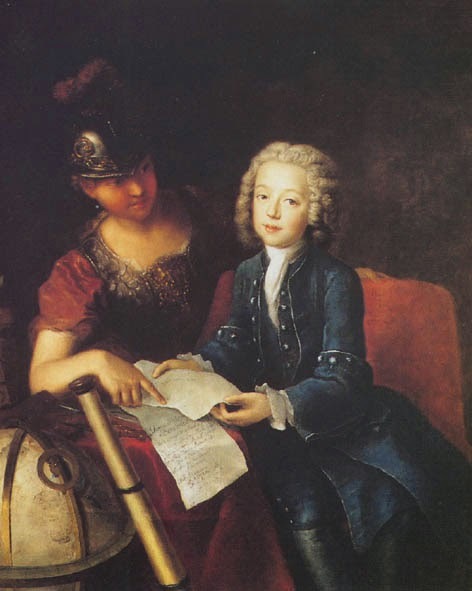 Just like the Infant Scholar of Lübeck, our guest today was a child genius who achieved enormous success and recognition yet was not destined to live through his teens. Jean-Philippe Baratier was born the son of a Huguenot minister, François Baratier, and in his early years he enjoyed a home education so comprehensive that, by the age of five, he was able to speak Latin, Dutch, French and Greek, whilst he was well on the way to mastering Hebrew. Clearly his endeavours were successful because his Latin and French translations of the Hebrew Bible appear in 1729, when Baratier was just eight years old. Although his health was frail, his mental powers were robust and inexhaustible and he strove to found new challenges and works to be completed. He translated multiple pieces from Hebrew into French and won the undying respect and admiration of no less than the star of our own Gallimaufry, Samuel Johnson, and Voltaire, who lauded his remarkable skills. From theology to mathematics, antiquity to literature, there seemed to be no field in which Baratier did not excel. Graduating with a Master of Arts at the age of fourteen, the boy's fierce intellect appeared to know no bounds and he was made a life member of the Berlin Royal Academy, where he embarked on studies of nautical longitude. However, this in depth work was not enough for the young scholar and he took on a number of projects that were wide in scope and mentally draining. Eventually the pressure of his commitments became too much and his frail constitution collapsed, with the young man dead of an unknown illness at just nineteen years of age. Poor kid! I wonder if the poor health combined with all that study to kill him? Geniuses often burn out before their time. It's just such a sad story.